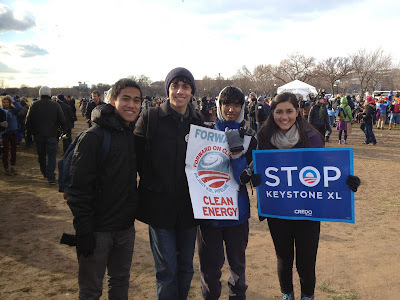 On Sunday, February 17th, 2013, approximately 50,000 people marched in Washington, D.C. at the Forward on Climate Rally. I was lucky enough to be among the masses of the concerned and sending news reports live to EcoWatch. 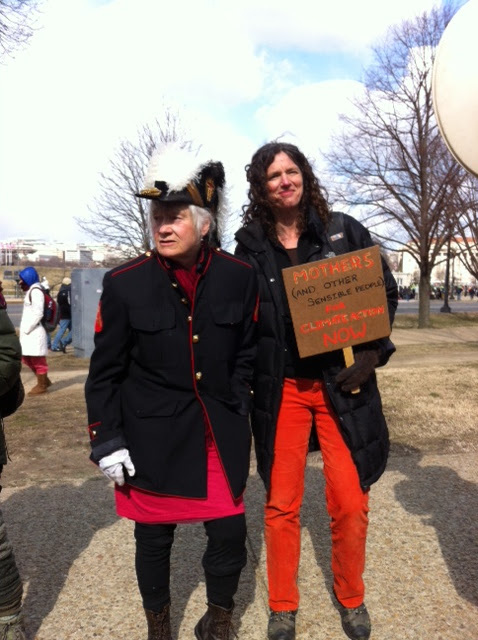 Here are some snapshots of the participants I engaged on the streets of our nation's capital. Thanks to everyone I met who emailed me pictures via their cell phones live from the rally! Linda Cahill from Virginia dressed as a Polar Bear as part of a Polar Bear Parade organized by the Alaska Wilderness League. Here she is before the rally started with the Capitol Building off in the distance. Linda is a supporter of the Gwich'in : A First Nations people who live in the northwestern part of North America mostly above the Arctic Circle. Photo by Molly Masterton. Linda: "I am against oil subsidies, drilling in the Arctic, fracking, and the keystone XL pipeline. It's time we take action. 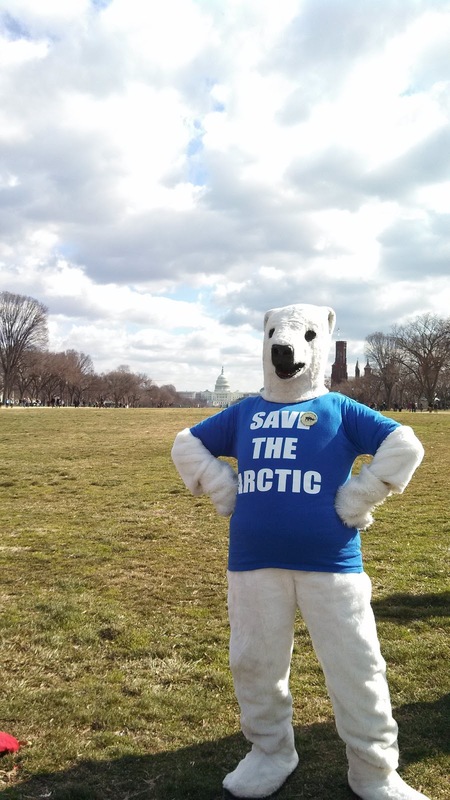 President Obama should require environmental impact studies before any drilling in the Arctic. I was shocked to find out that my President, for whom I voted, had not required Shell to do an environmental impact study on drilling in the Arctic. If there is a spill, it would take one year for them to clean it up because of short seasons. I am inspired by proactive people like the winners of the Goldman Environment Prize for excellence in protecting the environment: advocates like Maria Gunnoe, from southern VA, who fought to stop clear cutting of mountains for mountaintop removal coal mining. And Marc Ona Essangui from Gabon who helped publicly expose unlawful agreements behind a huge mining project that threatened Gabon’s rainforests. Marc now has a wheelchair, but his father used to take him to school on his back. I guess what I'm trying to say is that anyone can play a role, regardless of where they live or education, in improving the environment and that saving the environment can create jobs, contrary to what some people say. "There is no more important issue we face today than the climate crisis and, as a mother, I am terrified by the thought of the kind of world we will leave to our children and their children if the status quo continues. I'm here to deliver the message that it's time to change course. President Obama expressed a strong commitment to address climate change in his State of the Union address and he must now act on that commitment, reject the Keystone XL pipeline and take meaningful action to wean this country off of fossil fuels." I met John and Gretchen Mann in front of the White House as crowds gathered. Climate Santa John and his wife, Gretchen, are from Chestertown , Md. John: We wanted to be a force of momentum. I take kids kayaking on the Chesapeake Bay and we are both passionate about the environment. 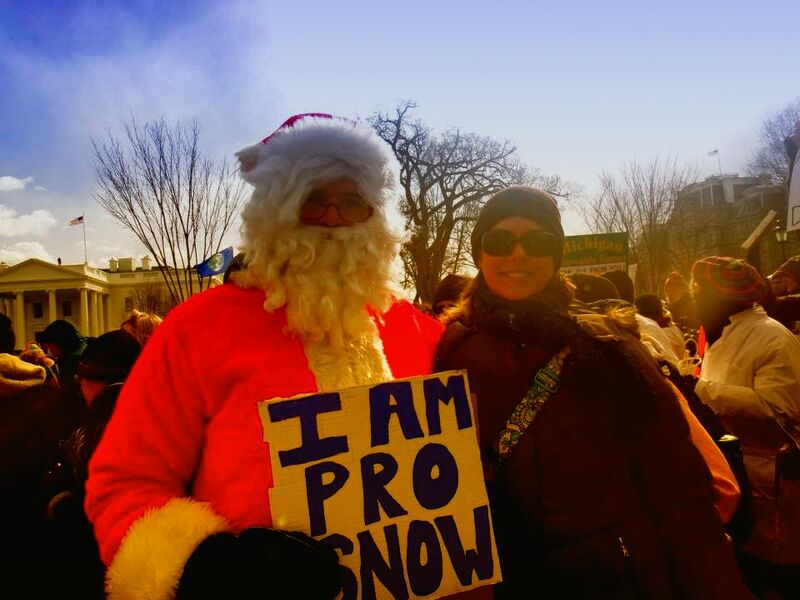 Gretchen: I am an environmental science teacher in High School and I am practicing what I teach. 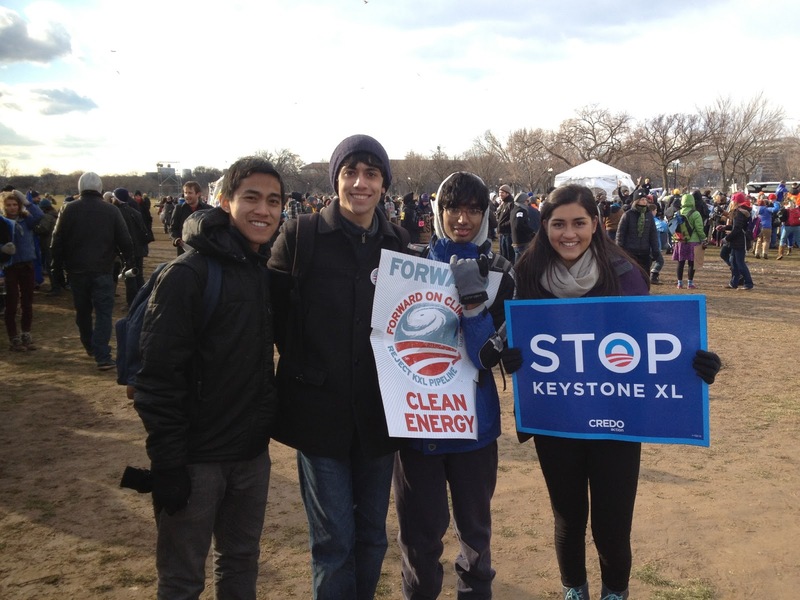 I met a group of students from Harvard after the march ended at the Washington Monument. They were super excited to have traveled from Boston together. From left to right:Dylan Cruz, Krishna Dasaratha, Akhil Mathew and Alyssa Chan. "I came to the rally because I think constructing the Keystone pipeline is incredibly destructive and needs to be stopped." 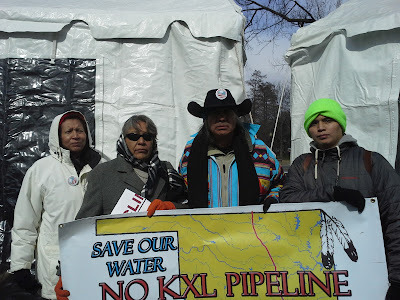 Backstage, before the march started and just before Bill McKibben took the stage, I met a cool group of Native Americans. 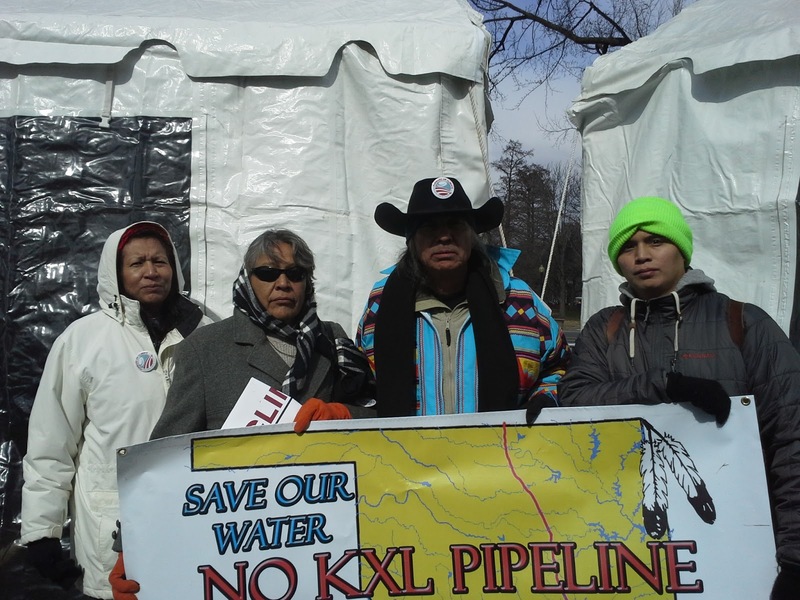 From left to right: (L-R): Lisa Montellongo, Cherokee, North Carolina; Missy Crow, Cherokee, North Carolina; Richard Ray Whitman, Oklahoma; and Tony Walking Stick, Cherokee, North Carolina. 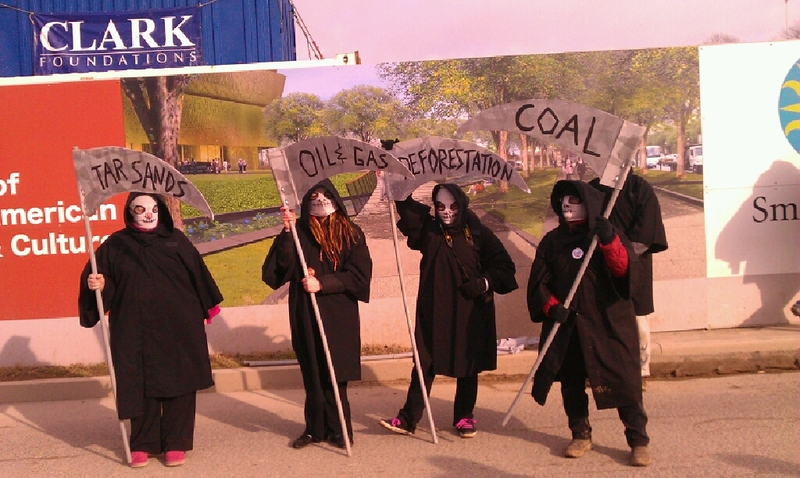 Photo by BJ McManama of the Indigenous Environmental Network. An activist group from Seattle, Washington who are members of BackboneCampaign.org. ("Artful Activism: Create visual soundbites for multitude of issues.") Photo by Celia Herrera. "This is our future. We are here to speak for our future. It's crazy not to be here. We need clean energy now!" Thanks for the Credit! Didnt even know the Reapers were from Seattle! So glad I picked people from my home town to photograph. Viva la Revolucion! Thank you for sharing the Indigenous voices at the rally! Was great to meet and share part of the march with you!